The brief was to create a small experiential space to sit within the existing surroundings of The Urban Food fest site hosting Bodega Garzón and Colinas De Uruguay. Over the course of two weekends, during July and August, we were required to provide a high impact branded zone. For Bodega Garzón a space that conveyed a luxury laid back vineyard feel and for Colinas De Uruguay a South American beachside cabana. In order to maximize budget and minimize waste we designed a simple bordered seating area to create a focal point for the many passing public and visiting foodies. 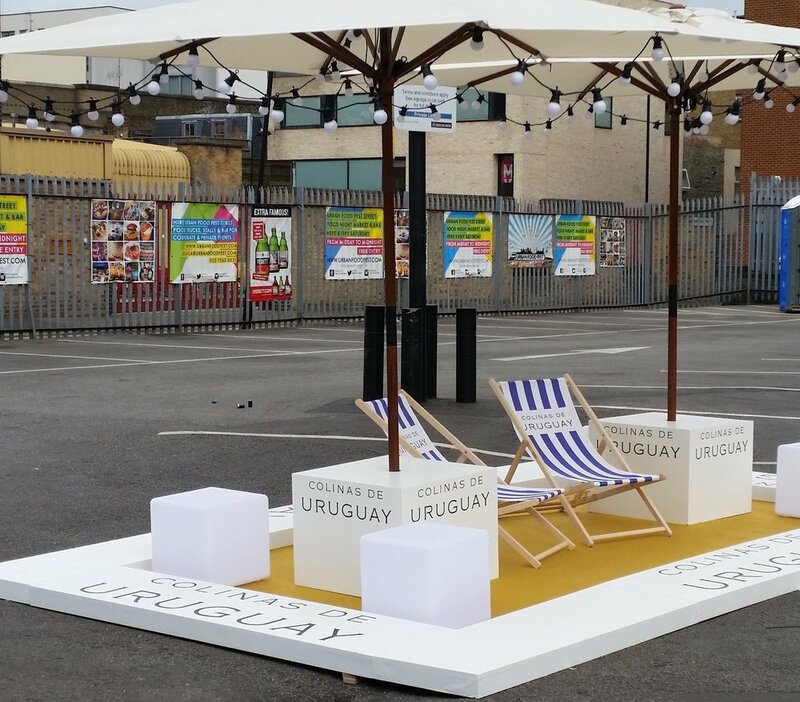 For the Bodega Garzón event we laid a luxurious deep pile artificial grass onto which we placed branded deckchairs and LED cube seating for visitors to sit back and enjoy some Bodega Garzón wine in the Summer sunshine. Large parasols adorned with warm white battery powered festoon lights provided a lovely continental feel as the evenings set in. “The installation by Partridge looked wonderful. It was great to see everybody enjoying it” – Bodega Garzón. 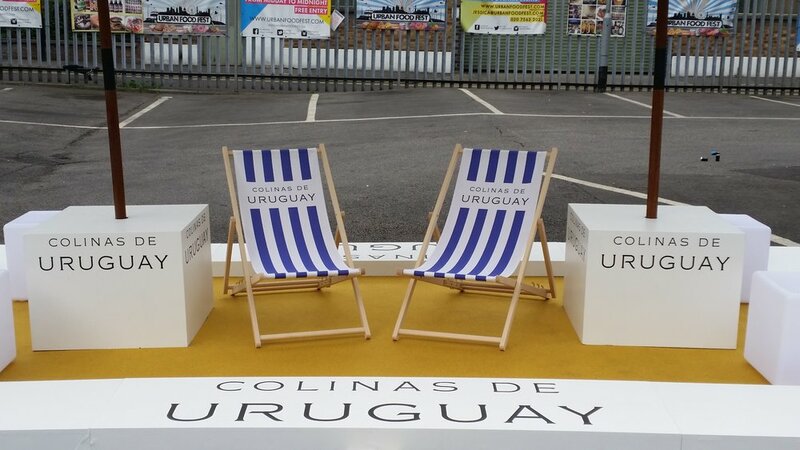 For the Colinas De Uruguay takeover we laid a fabulous glitter gold floor to represent the sand, along with Uruguayan Flag inspired deck chairs and twinkling multicolored lighting. 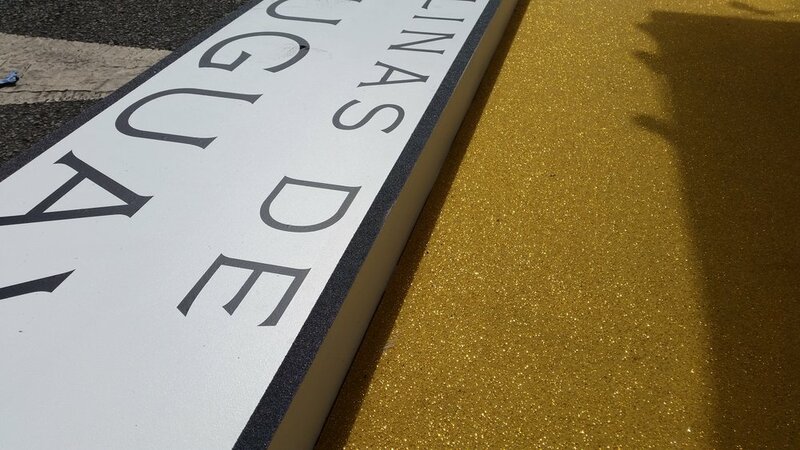 All border panels were resprayed and rebranded to create a contrast to the previous event. For both events Partridge undertook the concept consultation, visualizing, art working, sourcing, offsite/onsite construction and post event storage along with the standard Health and Safety administration required for public events. The event was greatly enjoyed by all! If you have a chance to head to Urban Food Fest it's an absolutely fantastic event and chance to enjoy some fabulous street food and cocktails!